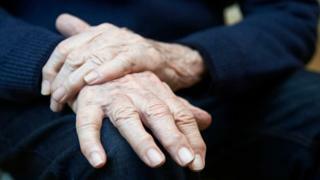 Scientists say they have found the first direct evidence that the immune system does attack the brain in Parkinson's disease. The role of "autoimmunity" was first suggested nearly a century ago, but had not been confirmed. The discovery, in the journal Nature, suggests that drugs to calm the immune system could help manage the disease. In Parkinson's the brain is progressively damaged leading to a tremor and difficulty moving. And at the same time very high levels of the protein alpha-synuclein accumulate in the brain. Scientists - at Columbia University Medical Center and the La Jolla Institute for Allergy and Immunology - analysed the blood of 67 patients with the disease to see if they could find evidence of autoimmunity. The team discovered that T-cells, a part of your immune system, were launching an assault on the alpha-synuclein. It means the immune system is recognising alpha-synuclein as a foreign invader such as a bacterium or virus. It is likely the immune system tries to purge the body of alpha-synuclein and kills brain cells where the alpha-synuclein accumulates. "But until now, no one has been able to connect the dots." He believes that the study ties in with an another emerging theme in Parkinson's - that the disease may start in the gut. Prof Sulzer told the BBC News website: "We imagine that T-cells may first identify alpha-synuclein out in periphery, particularly in the nervous system of gut which is not a problem until the T-cells enter the brain." Dr Alessandro Sette, from La Jolla, said: "Our findings raise the possibility that an immunotherapy approach could be used to increase the immune system's tolerance for alpha-synuclein, which could help to ameliorate or prevent worsening symptoms in Parkinson's disease patients." David Dexter, from the charity Parkinson's UK, said: "This research lends weight to the radical idea that the condition may involve the immune system becoming confused and damaging our own cells. "We still need to understand more about how the immune system may be involved in the complex chain of events that contribute to Parkinson's. "Ultimately this presents an exciting new avenue to explore to help develop new treatments that may be able to slow or stop the condition in its tracks."